Fresh pressed, high lignan, high GLA (Gamma Linolenic Acid) from borage oil. Lecithin rich with Vitamins E and C and bioflavonoids for unparalleled protection of flavor and freshness. Absolutely delicious. It's the most complete essential fatty acid product available anywhere. 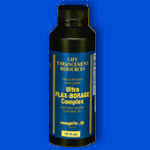 Ultra Flax-Borage Complex contains seven products in one bottle. Flax Seed Oil is an excellent time-tested source of both Omega-3 and Omega-6 essential fatty acids, but is especially valued as the richest source of Omega-3, which is minimal or completely lacking in most other oils. In addition, it contains naturally occurring lecithin and other phosphatides, beta carotene and other potent carotenoids, mixed tocopherols (Vit. E), and oleic acid. Its historical use for good health is almost legendary! Borage Oil Although it also contains Omega-6 essential fatty acid, borage oil is the very best source of GLA (gamma-Linolenic acid), which many people cannot convert from Omega-6 due to nutritional deficiency or imbalance. It works wonderfully with the essential fatty acids and has been used very successfully "to help those with illnesses such as arthritis, allergies, multiple sclerosis, cancer, arteriosclerosis, immune system deficiency, diabetes, obesity, PMS, alcoholism, liver degeneration, depression, colitis, skin disorders, and other conditions." Borage seed contains twice as much GLA as evening primrose oil. Lecithin L.E.R.H.M. has added extra lecithin which supplies inositol, and choline which is necessary to form the neurotransmitter acetylcholine required for nerve and brain function. Lecithin also supplies both Omega-6 and Omega-3 essential fatty acids. It helps keep cholesterol soluble, isolated from arterial linings, and protects it from oxidation. It's important for liver detoxification and is a very important part of our cell membranes. It's extremely valuable as an edible detergent which emulsifies fats and speeds up and increases the efficiency of fat and oil digestion by enzymes. Finally, it also creates a more creamy than oily taste and texture. Flax Seed Fiber is the best of the few foods that contain both soluble and insoluble fiber. It is also the very richest source of very valuable plant lignans, having over 100 times more than the next best source. Lignans have been shown to have anti-cancer, anti-tumor, anti-bacterial, anti-fungal, anti-viral, anti-oxidant and anti-estrogenic properties. Besides wonderful nutritional benefits, the flax fiber enhances the taste of our formula with a delicious nutty flavor. Vitamin E (alpha-tocopherol) In addition to the naturally occurring mixed tocopherols and beta carotene which protect the oil from oxidation, L.E.R.H.M. has added Vitamin E (alpha-tocopherol) to further protect the precious essential fatty acids in the bottle and in our bodies. It also recharges the beta carotene and glutathione as antioxidants as well providing wonderful benefits for our cells and cardiovascular systems. Vitamin C (ascorbic acid) Since oxidation can be an oil's worst enemy, L.E.R.H.M. added Vitamin C to our formula since it's considered to be the most powerful of antioxidants normally found in our bodies. It not only quenches free radicals but also recharges Vitamin E as an antioxidant. Finally it adds a delicious citrus-like taste to the formula. Bioflavonoids As a final complement and active synergist L.E.R.H.M. added bioflavonoids to the team of antioxidants, which works synergistically with Vitamin C and also recharges Vitamin C as it is used up quenching free radicals. Nothing has been spared to bring you the most nutritionally valuable essential fatty acid product ever produced at a cost you can afford, in order for you to avoid a cost in lost health you can never afford! Flax Seed Oil is the very best oil there is in every way. It has a light and pleasant aroma and taste, as well as being an excellent source of both essential fatty acids. They are called essential because our bodies absolutely have to have them, cannot make them, and must get them from our food. "Of 45 essential nutrients discovered so far... Linolenic acid (LA,18:2 w 6) is the one the body contains and needs the most of." However, recent research clearly exposes the fact that we are more deficient in Linolenic (Omega-3) acid, and that "for many purposes Omega-3 EFA actually do a much better job than Omega-6." Since balance is the essence of health we must have a resource to supply the missing essential fatty acid, Omega-3, in our diet. Flax seed oil is exactly "what the doctor ordered". Until a body has satisfied this deficiency however, the other oils providing the excess Omega-6 in our diets should be minimized. This can require 2 or more years. Then a wide variety of properly Omegaflo prepared oils can be utilized intelligently and safely in addition to flax seed oil. Essential fatty acids, being the number one nutritional requirement of our bodies. are necessary for: energy production; attraction of, transport through, and retention of oxygen in our cell membranes; hemoglobin production; healthy membrane construction; recovery of fatigued muscles; production of prostaglandins; growth and cell division; soft, smooth skin; increased stamina, healing, and vitality; brain development and regeneration; buffering excess acid and alkali; immune function; and in every facet of creating and maintaining optimum health in our bodies. "In short, essential fatty acids govern every life process in the body. Life without essential fatty acids is impossible. When essential fatty acids are deficient, we can expect a diversity of health problems." In short, it contributes to each of these progressive, degenerative diseases in a slow, insidious, debilitating manner. Proceeding to Solutions: in selecting a product to meet our needs, "in the best of all possible worlds, what would the labels tell us?" Date of Pressing: Yes, and at least a 10 month shelf life! Organic or Non-Organic: Organic, Certified by FVO, Medina, N.D.
A Word About Trans Fatty Acids and Partially Hydrogenated Oils. If there is one class of substances not to put into your body, this would be it. The process of partial hydrogenation takes a good unsaturated vegetable, seed, or nut oil; partially saturates it with hydrogen in the presence of a toxic metal catalyst (some of which often remains in the oil); destroys the good biological properties of the oil, and turns it into a mutant, unnatural, toxic, nightmare for your body. In essence, the trans fatty acids interfere with essential fatty acids function and directly contribute to development of many deadly degenerative diseases. Based on the expense of the seven separate products combined to create this unique synergistic and complete formula, it would cost you at least $27.00 and up to $45.00 or more depending on the source and quality of nutrients selected. L.E.R.H.M. has already done the work for you, carefully researching and formulating this wonderful product which not only is the most valuable essential fatty acid formula ever, but also the most affordable and most delicious as well. Chronic degenerative disease is more rampant now than ever in the history of the world. Modernized cultures eat highly refined and highly deficient diets composed of what used to be good wholesome, unrefined, nutritious food. Excellent building materials build excellent houses. Excellent nutrition can build excellent bodies and excellent health. What in the whole world is more important to you than your health? What is it worth? "Fresh flax oil, properly made, ought to become part of the intake of virtually the entire population." "The Omega-3 and Omega-6 essential fatty acids are nutrients vital to nearly all bodily processes. They nourish the body and help prevent and heal many conditions." "Fat-metabolism is so totally involved in all vital life functions, and in the functioning of every organ - necessary for life itself, including the generation of new life - that deficiencies in unsaturated fats can no longer be justified." We at Church of Abundant Life Health Ministry are committed to helping you and your doctor maintain your good health. For more information on essential fatty acids, enzymes, oxygen, and public seminars for your group or club, please contact us.